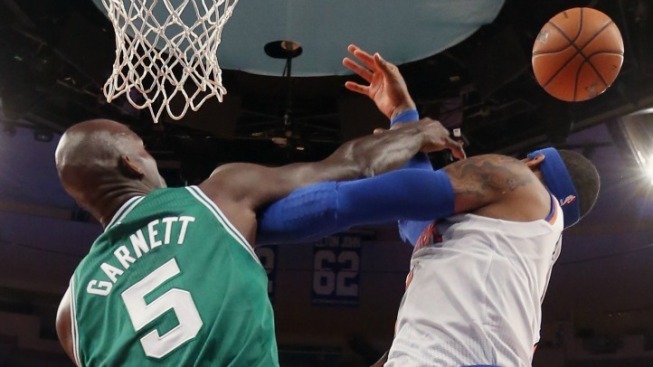 Garnett won't be a problem this time around. Until the Celtics lost six of their last eight games, it was hard to feel totally secure about the changing of the guard in the Atlantic Division. We're not sure yet whether or not the Knicks will hold off the Nets for the division title, but it's hard for anyone other than the most cockeyed of optimists to believe that the Celtics are making up a six-game deficit in the final 12 games of the season when they don't have Rajon Rondo. Or, perhaps, Kevin Garnett. Garnett won't play against the Knicks on Tuesday night, robbing us of a chance to see if Cookie Crisp or Frosted Mini-Wheats would join Honey Nut Cheerios in this season's vernacular. It also, more significantly, means that the Celtics are without the man who drives their defense. With Garnett on the floor, the Celtics give up 96.6 points per 100 possessions, which would be the second-best total in the league. Without Garnett, they drop all the way to 103.7 points per 100 possessions. That's a stark difference, one that makes it easier to swallow another night without Tyson Chandler in the lineup and easier to think about the implications of a Knicks win. The obvious and powerful one is that they'd spend another day at least maintaining their edge over the Nets, who continue their long road trip in Portland on Wednesday night. Another one is that the injury-riddled Celtics are now just two games ahead of Milwaukee as the seventh seed for the playoffs, leaving them in pretty serious risk of tumbling down into that spot before the regular season comes to an end. Finishing eighth means a date with the Heat and, barring a pretty serious injury to LeBron James, that means an early start to summer vacation. Should the Celtics hang out in seventh or figure out a way to move up to sixth, there's the prospect of a first round series with the Knicks. The Celtics might be missing Rondo and Ray Allen and the mojo they've had for the last few years, but it is hard to imagine that any Knicks fan would be thrilled with the idea of facing the Celtics in a playoff series. There's something about the uniform and the history that makes you ignore all the realities of the players who are actually on the Celtics this year. Paul Pierce alone is enough to make you want to never see the Celtics again, so let them be Miami's problem. To make that happen, Carmelo Anthony will need to be as sharp as he's been since returning from his knee issue and the defensive intensity of the last few games has to remain in place even if Garnett's absence changes the tenor of things a little bit. The Knicks have playoff teams on the schedule in seven of their next eight games, which means that they won't get the kind of easy opposition they faced the last three nights. It's good preparation for the playoffs and Tuesday's a good way to cement the new pecking order in the Atlantic.